As per Tracy's suggestion, there's a permanent link to the wiki contest and how-to in the right hand side now, underneath the ads. Click there whenever you need reassurance. Also, in addition to the $100 gift certificate from Janet at Lanetz Living, Rita at Chez Cemetarian has offered a $50 gift certificate for 2nd place! Thanks! UPDATE! Michelle from Patterns from the Past *and* Tina at What-I-Found *and* Jen at MOMSPatterns have all offered additional prizes! There will be much to be won, oh, yes! 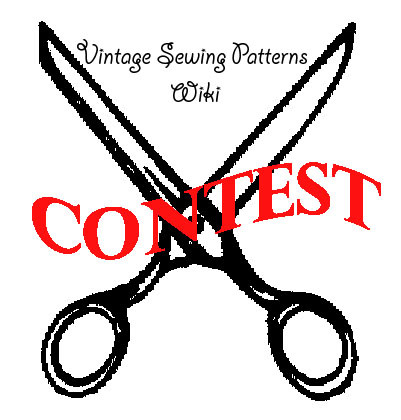 One more thing: lots of people on Flickr have posted pictures of their vintage patterns under a CC (Creative Commons) license … as long as you give attribution (a link back to the Flickr page) it should be kosher to add these pattern images to the wiki! Try this search to see what you find … or you may want to leave comments on people's Flickr images encouraging them to contribute to the wiki! I’ve done some photography for Ebay auctions in the past. Here are the tricks I’ve discovered for getting the best image.First, go with natural light whenever possible. If necessary, bundle up and go out on your porch, patio, or balcony. Even on an overcast day, the daylight is stronger than indoor lighting. You don’t want sunlight directly on your pattern, though. That tends to overwhelm the camera’s meter and give you an image that’s difficult, at best, to correct.Put the item on a background. I find a piece of brown cardboard works better than white, believe it or not. I pretty frequently use the back of my sewing cutting board.Put it flat on the ground. You can bend over at the waist and shoot straight down. Zoom in as appropriate. Watch out for hair, necklaces, draw strings, or whatever – they will end up in the frame given the slightest opportunity. (I have hip length hair, and have learned this lesson numerous times).The biggest help for images is actually in your photo software. The obvious one is crop it tight. But there are things you can do to brighten and color correct the image with very little difficulty.I work mostly with Photoshop Elements, occasionally with Gimp. The first thing I do when working with an image of a paper item is tell the software what part of the image is white. In Photoshop Elements, you’d go to Enhance menu, select Adjust Item, then Levels. This brings up a screen that has, among other things, 3 little eye droppers on it. The left eye dropper is for black, the middle one is for gray, and the right one is for white. I usually click on the white one. Then you pick a spot on the image that is supposed to be white and click on it. You might have to try a couple of spots to get the best results. You might also have to pick a black spot, using the black eyedropper, in addition.Usually, the light levels, colors and contrasts will be more or less corrected. You can fiddle further with the various flavors of contrast, but most of the time you won’t need to.Hope this helps. Do the Wiki entries need to be patterns that are supposed to be available to sell,trade or whatever?I have some that would qualify age-wise but I want to keep them! I would happily upload pictures and descriptions if the Wiki is also there to catalogue existing patterns, as opposed to buy/sell/trade them. Dear Pirate — the wiki is just a catalogue of all the patterns, ever, not ONLY those for sale. We’re emphasizing the ‘sale’ part right now because so many sellers have so many images! Please go ahead and upload yours — we promise not to try to buy them. :-)Thanks! Erin – how do you feel about damaged pattern envelopes? would it be okay to make a pattern page with a scan of a bad envelope and ask for a new scan if anyone ever finds better? A couple of my really old/odd patterns are not in great shape, but I have never seen them in better. Of course this is assuming I find the time to scan and upload them in the first place!! thanks! Sarah, I’ve been uploading yukky envelopes, but trying to do it only IF it’s such a cool pattern it shouldn’t be excluded! I think that’s a good idea though to maybe note in the description ‘If you have a better scan, PLEASE reupload this image and remove this request!’ or something.. just so we can keep things clean looking!I think we’re gonna hit 1,000 today! WOOT!